Spokane Sunday, a wonderful wine experience. Here's our lucky couple, about to enjoy their Santé Restaurant and Charcuterie packed picnic at Arbor Crest with their cool new basket. We have a winner..... Tarah Kay Patterson. Congratulations! 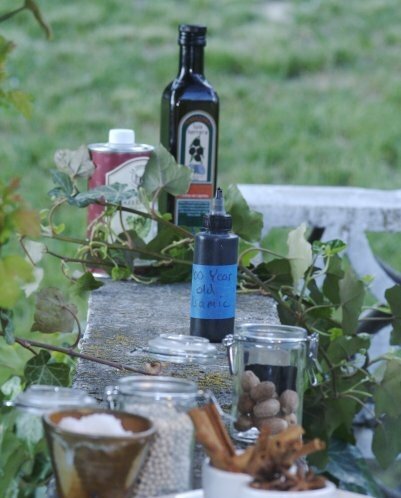 Wine tease #3 Your gourmet Picnic will be designed by Santé Restaurant and Charcuterie. Perfectly packed in your new basket and ready for pick up at 5pm on Sunday July 25th. This is your opportunity to experience Santé, who is known for specializing in seasonal cuisine, house-made charcuterie, breads and cheeses. French techniques, northwest products. Voila! Sante Restaurant & Charcuterie is one of my very favorite restaurants. Simply elegant, but not pretentious, Santé is nestled by Auntie's Bookstore in the Liberty Building in Downtown Spokane and features Northwest food freshly prepared with a French accent. On my first visit I was served a chef's sample and that was the piece d' la resistance even though I had already decided this was my new favorite restaurant. I went 3 times that first week. The patio dining is delightful and they have French conversational times in which all levels welcome. One of our region's most celebrated chefs, the talented Jeremy Hanson is dedicated to farm-to-table dining for a freshness you can taste. At Santé flavor matters.They also make a pretty perfect latte for when you want to peruse the shelves at Auntie's Bookstore. Call Santé and it will be their pleasure to design a perfect picnic especially for you. 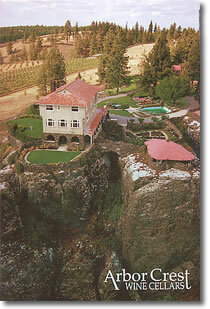 Wine tease #2 The basket experience takes place at the picturesque Arbor Crest Cliff House on Sunday, July 25th. When you arrive at 5:30 pm the Arbor Crest Cliff House you'll have VIP parking and complimentary admission. You and a guest will escorted to a exclusive wine tasting highlighting Arbor Crest's new releases where you'll then choose a bottle of your favorite to accompany your picnic. You'll have a reserved table for two in the event tent where the live music plays until dusk. Tomorrow you'll find out about what is in the basket and be able to post the "Weekend 'O Wine" report on your profile to enter. The basket has a pretty cool first date planned. The choice is made randomly through a drawing. I could never choose :) Good Luck! I can't decide with Tease I like better... .they are all great images!! This set is beautiful...I could not find it on the website? I think they are running low so it is temporarily not on the website. However, it's in the brand new catalog, so a reorder should be arriving. 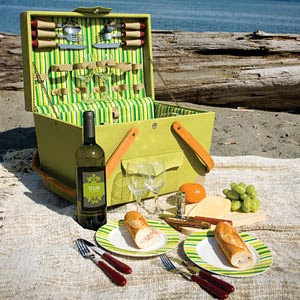 It is actually called Sonoma Sunday Picnic Set (item #758) You can call 1(800)750-8783 to order one. Have them send you a catalog -great wine stuff and such beautiful quality. (7/12) just in case you win.